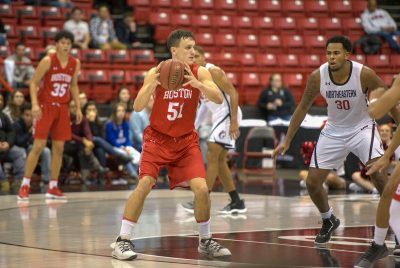 Despite a career night from junior forward Tyler Scanlon, Boston University fell to Lafayette College by a score of 79-72 Wednesday night. Scanlon dropped a career-high 28 points in Case Gym, shooting a robust 10-17 from the field and 4-8 from beyond the arc. He also chipped in seven rebounds. However, in a game that featured 11 ties and 15 lead changes, the Leopards’ (6-16, 3-8 Patriot League) consistent shooting accuracy decided the score. They shot 54 percent from inside the paint and shot 43 percent beyond the arc. Both teams started confidently out of the gate, passing the lead back and forth. Sophomore forward Sukhmail Mathon opened the game with a hook shot, though Lafayette would quickly put up five points to go ahead. The Terriers appeared to have momentum midway through the first half, as a 10-2 run powered by junior forward Max Mahoney propelled the squad to a 23-17 advantage. The Leopards responded with seven straight of their own to wrestle back the lead. Lafayette entered halftime on top, 39-38 after a combined nine lead changes in the first 20 minutes of action. The offense made impressive work of the Terriers’ zone scheme in the first half, as the Leopards made 54 percent of their long balls. Neither side let up coming out of the locker room. With the Terriers leading 55-52 with 12 minutes remaining, Lafayette used a quick 8-0 spurt to grab a 60-55 advantage. This time BU battled back, pushing ahead 63-62 after freshman guard Garrett Pascoe converted a tough layup. The Leopards’ collective hot shooting never faded. Another 10-2 run gave Lafayette a 72-65 lead with two minutes remaining. The gap would prove too much for BU to overcome. Scanlon spoke about the loss after BU fell. Four Leopards scored in double figures, led by 20 points off the bench from guard Alex Petrie. The sophomore converted eight of 14 shots as a second-unit spark. In contrast, the Boston University bench scored 10 points altogether. The Terriers were outscored 14-9 in the final five minutes when Lafayette closed out the win. Moving forward, Jones said he wants his team to be “confident and calm” in late-game scenarios. Jones said also that he thought the Terriers lacked the focus they displayed in their previous two wins. BU’s next test is away at Lewisburg, Pennsylvania, against conference powerhouse Bucknell University. The Bison currently lead the Patriot League with their 9-2 record in Patriot League play and are 15-8 overall. Tipoff is scheduled for noon Saturday. Now in last place in the Patriot League. A total of 5 wins against teams with winning records. Where, pray tell, is this program going?